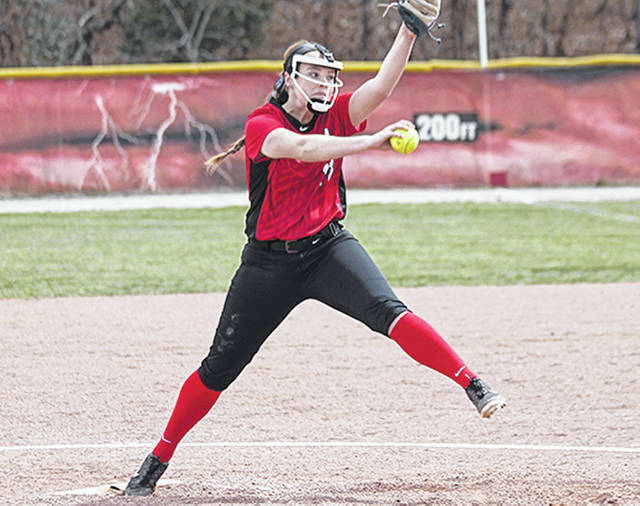 Rio Grande’s Nicole Brown retired 16 of the final 17 batters she faced in Sunday’s 5-2 game one win over Lawrence Tech in Rio Grande, Ohio. RIO GRANDE, Ohio — Nicole Brown retired the final 13 batters she faced, while teammates Michaela Criner and Kelsey Conkey added insurance runs with fifth inning home runs in the University of Rio Grande’s 5-2 game one win over Lawrence Tech (Mich.) University, Sunday afternoon, in non-conference softball action at Rio Softball Park. The Blue Devils avoided a sweep of the twinbill, pushing across an unearned run in the seventh inning for a 1-0 triumph in the nightcap. Rio Grande finished the day at 18-10 with the split. Lawrence Tech, a member of the NAIA’s Wolverine-Hoosier Athletic Conference, returned north with an overall mark of 18-2. Brown, a freshman from Amelia, Ohio, had the best outing of her collegiate career to date, allowing four hits and two runs – only one of which was earned – in a complete game effort. The right-hander walked just one and fanned two, while retiring the side in order over the final four innings and sitting down 16 of the final 17 batters she faced. Both of the runs surrendered by Brown came in the first inning, but Rio countered with three runs of its own in the home half of the frame after loading the bases with no outs. Criner, a junior from Bremen, Ohio, was hit by a pitch and eventually scored on a passed ball, while freshman Taylor Webb (Willow Wood, OH) added a two-run single later in the inning to put the RedStorm in front. That’s how things stayed until the fifth inning when Criner led off with a home run and, two outs later, Conkey – a senior from Minford, Ohio – added a solo shot of her own. Alexa Cherney started and took the loss for LTU, allowing four hits, two walks and the five runs over 4-2/3 innings. It was her first loss in seven decisions. Brittney Bult had two hits in the loss for the Blue Devils, while Andra Malburg and Brittany Wieland drove in one run each. Game two proved to be a pitcher’s duel between Conkey for Rio and the duo of Sydney Schultz and Bult for LTU. The game’s lone run came in the top half of the seventh when Wieland reached on a leadoff error, Alex Amos singled, Jackie Mattingly bunted both runners into scoring positions and, after Kennedy Emmons struck out, Sarah Hige reached on an infield single with Wieland racing home to break the scoreless deadlock. Rio Grande got a two-out single from junior Lexi Philen (Tallmadge, OH) in the bottom of the inning, but Bult retired Criner on a flyball to deep left to seal the win. Bult tossed five innings of scoreless relief to get the win, scattering four hits – all singles – and striking out two. Hige finished 2-for-4 in the victory. Conkey was the hard-luck loser, allowing seven hits and the unearned run with four strikeouts in a complete game effort. Rio Grande is scheduled to return to action on Tuesday afternoon when it hosts Shawnee State University in non-conference play. First pitch for game one of the doubleheader is slated for 3 p.m.